Riders who take the Circle Line (CCL) have had a rough week. Even on the holiest of all workdays, signalling faults have plagued the service and mobile coverage has been suspended yet again, due to the conducting of tests to “identify the cause of signal interference”. 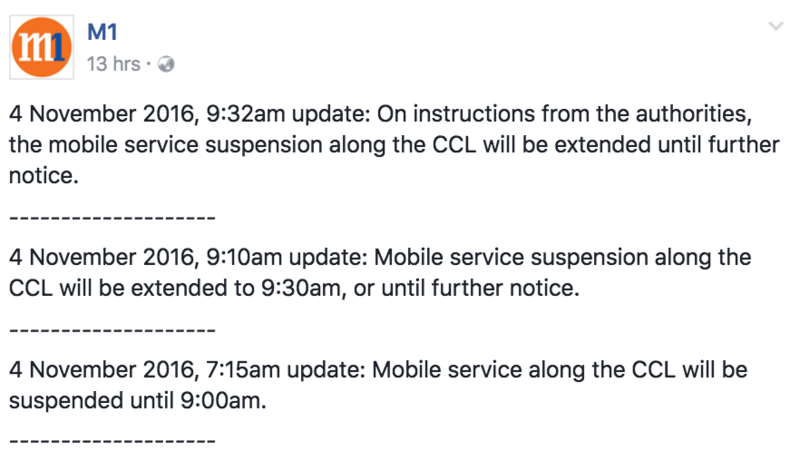 [CCL] Due to ongoing tests, commuters travelling along the Circle Line will experience temporary suspension of Telco signals. Singtel, M1 and Starhub have confirmed the suspension, and according to a report on The Straits Times, even though Singtel and M1 announced that their services would be back at 9am, the timing was eventually pushed by to 9:30am. 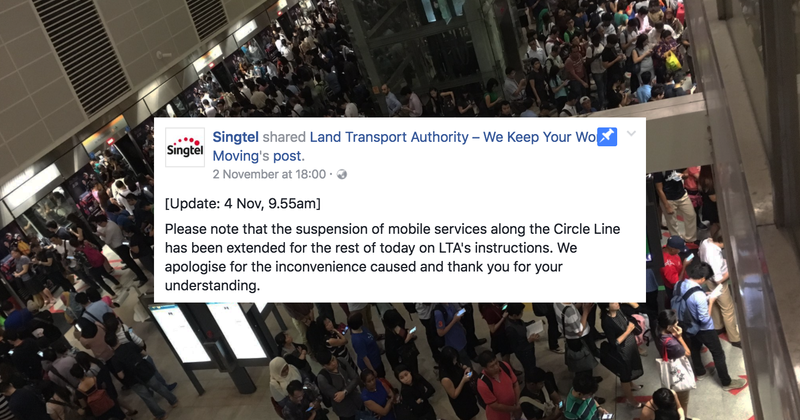 However, a quick check on Singtel’s Facebook page reveals that under LTA’s instructions, mobile services on the line have now been “extended for the rest of today”. As mentioned previously, CCL riders have had to deal with stressful mornings this week. On Wednesday morning, the similar “intermittent signal interference” caused disruptions and delays on the line for close to 3 hours. Due to signalling issues, trains were travelling at lower speeds, some even stalling at certain stations. Free bus services were eventually deployed to help ease the congestion, and get frazzled Singaporeans to where they needed to be. Commuters were nonetheless frustrated, and some have revealed to Channel NewsAsia that “there was a lack of information from SMRT and […] insufficient shuttle buses for those stranded”. One was even reported to have been stuck in a train at the Lorong Chuan station for an hour. Not surprisingly, many had also taken to social media to post photos of MRT stations packed to the brim with commuters. Last night at around 8:50pm, news of Singtel, M1 and Starhub suspending all their mobile services on CCL broke, citing that the authorities were doing investigations on the delays. Two hours later, at around 10:20pm, SMRT tweeted that mobile coverage had been resumed. [CCL] UPDATE: Tests have been completed. Telco signals will progressively resume along Circle Line. While many have assumed the best, and that engineers were closer to identifying and solving the cause of the recurring delays (which also happened in September), it seems like they were once again greeted with the same fault, and subsequent cut of mobile coverage this morning. The actual cause of the faults have yet to be identified, but back in September, SMRT and LTA had stated that “an interfering signal in the Circle Line tunnel within the operating frequency band of the trains’ signalling system” could have been the culprit. 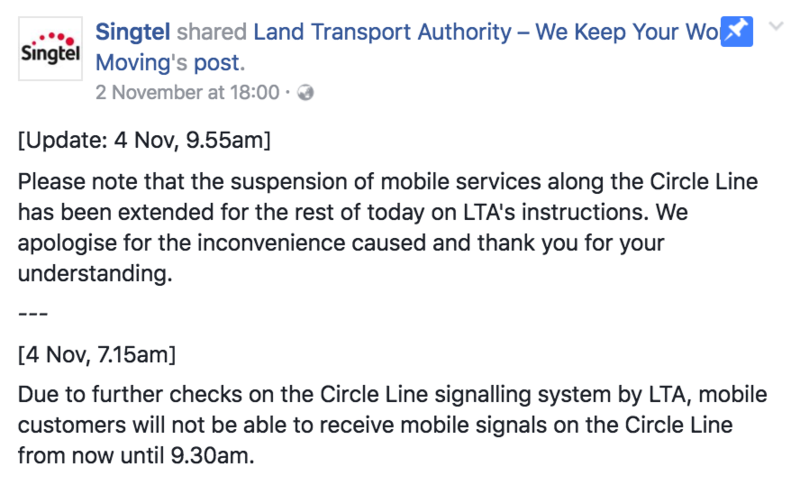 Tests conducted in September which saw mobile signals being temporarily switched off at four Circle Line stations to see if there was any correlation between interference between the telecommunications network and train signalling system had also brought about inconclusive results, since there were no incidents during those few hours. Hopefully, the tests this time would be able to bring the engineers closer to the cause, but till then, do avoid the Circle Line if you’re going to need mobile coverage 24/7. But hey, perhaps with social media and sms distractions out of the way, we can finally rediscover trusty, offline apps like Voice Memos, Notes and…I don’t know, reorganise your contact list while at it?